Eli McCauley would cast his vote in favor of moving the capital of Dakota Territory from Yankton, but he wanted something in return. That something was to have a county named after him. The usual process of creating and organizing a county in territorial days, according to “South Dakota Geographic Names” edited by Virginia Driving Hawk Sneve, was for the legislature to create a county by defining certain boundaries and selecting a name. Next, the inhabitants petitioned the governor for organization. The governor then appointed three county commissioners, who in turn appointed the first county officers. McCauley was a member of the 1883 Legislature. A bill was passed during that session to enlarge Brown County by adding townships from Edmunds, McPherson and Day counties and then dividing Brown County into four separate counties, each with a county seat. These counties would be named McCauley, Edgerton, Inman and Brown. Alonzo Edgerton was chief justice of the territorial court; Darwin Inman was a banker and legislator from Vermillion; and Alfred Brown was a territorial legislator. The bill would only become law upon the approval of the majority of voters in the district comprising the four proposed counties. Voters did not approve, so the counties of Edgerton, Inman and McCauley do not appear on maps. According to the South Dakota State Historical Society, Edgerton, Inman and McCauley are but three of 44 counties that were created in South Dakota that no longer exist. Here is a look at a few more of these ghost counties. Downer Bramble was a leading figure in the early history of Yankton. He operated the first general wholesale business in Dakota Territory, with a branch store in Fort Pierre and a big business in the Black Hills. The 1873 Legislature attempted to perpetuate his name in geography by naming a county in his honor. 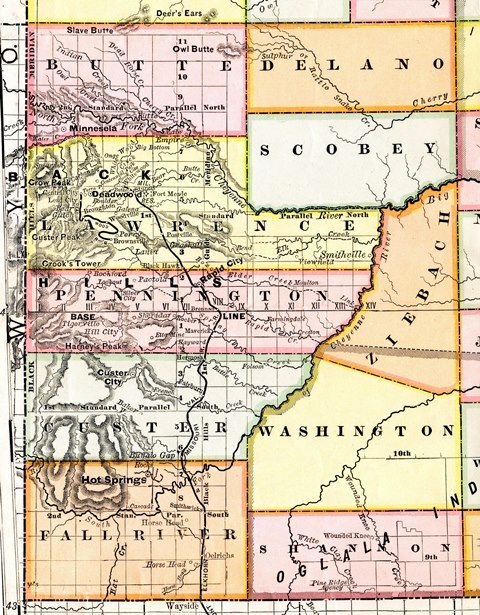 The 1879 Legislature dropped Bramble and redrew Miner County’s boundaries to embrace all that is now Miner and Sanborn counties. James O’Brien Scobey was a lawyer and legislator from Brookings. He secured Brookings as the location of a land-grant institution. A building on the campus of that land-grant institution, South Dakota State University, bears his name. The county that was named for Scobey in 1883 is now part of Meade County. Delano County also became part of Meade County. Delano County was named for Columbus Delano, who served as U.S. Secretary of the Interior from 1870 to 1875. Rusk County was named for Gov. Jeremiah Rusk of Wisconsin. The name was later changed to Dewey County in honor of William Dewey, Dakota Territory surveyor-general from 1873 to 1877. William Dewey was the brother of Wisconsin’s first governor, Nelson Dewey, so Dewey County has connections to two Wisconsin governors. Jayne County was created in 1862 and would have ensured that the name of Dakota Territory’s first governor, William Jayne, lived on in South Dakota history. It was never organized, but remained on the map until 1871 when it was absorbed by Turner and Hutchinson counties. While some counties were named for physical features, American Indians, military officers or animals, legislators named the majority of counties after other legislators and political officials.